THE RIPPER: This story is about a serial killer that targets prostitutes. He lures them to his home and tortures them in his garage, but the last one he takes home is not going out without a fight. This was probably my favorite of the three stories, mainly because I'm a sucker for gore and this film had tons of it. STITCHGIRL: This story is about a man looking for the perfect girl for his time at the bordello. If the madame of the bordello doesn't have just what the men order, then she will make the perfect girl for him! This was a very good film, shot mostly in black and white, this one is very atmospheric and cool visually. Stitchgirl is made from the best parts of several prostitutes, making her like a modern day Frankenstein's monster. She actually resembles Sally from THE NIGHTMARE BEFORE CHRISTMAS and at one point the film looks awfully like a Tim Burton film. If the director is a Tim Burton fan and was trying to pay respect to him, then he hit a home run with this one. My sole complaint is a weird music video featuring Stitchgirl in the middle of this segment. It seemed out of place and messed with the flow of the film. This didn't cause me to not enjoy the film though, but seemed worth mentioning. VICE DAY: I guess this one was my least favorite of the three stories, although I still enjoyed it. This one is about a web cam session gone wrong. A prominent politician has a web cam session with a local prostitute on what he calls, vice day. It's a day celebrating a game he has played each of the last few years where he puts a bullet in a pistol, spins the barrel, puts the gun against his head and pulls the trigger. Each year he adds a bullet, so every year his chances of survival get slimmer. Will the prostitute on the other end of the web cam chat witness his final game? 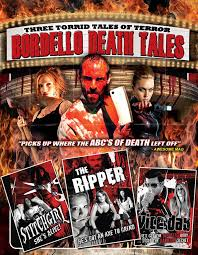 BORDELLO DEATH TALES is available now from Chemical Burn Entertainment. I'll be honest, I don't read much these days. I just don't seem to find the time with a full time job and a family, to sit down and read most books. Also, I am a bit of a slow reader, and I have an awful memory, so if I am reading a book and I go a few days without reading, I tend to forget what was going on and have to go back and re-read chapters. I tell you this to explain why I love books like HIDDEN HORROR from Dr. AC! I love books about movies and reference books like this are perfect for me. If you don't have time to sit and watch a movie, it is a lot of fun to be able to take a few minutes and read about it! And each essay is about a different movie, and only 2-3 pages long on average, so you can read just a few minutes if that is all you have time for. Now, a lot of reference books are like this, but you tend to start reading about the same mainstream or cult status films when you read a horror movie reference book. What this book does differently is focus on those films that normally wouldn't get much, if any, write up in any movie reference book. That is one of many things that sets this book apart from others like it. Another is that each essay was written by a different author, so if you don't like the style one of the essays is written in, well the next one will be completely different since it will be by a brand new author! I had a good time reading all the different authors and was excited to see that I knew a couple of them from my blogger circle of friends! I know B.J. Colangelo from the "Day of the Woman" Blog who wrote an essay on the film, I SPIT ON YOUR GRAVE (a movie I don't think is overlooked, but definitely underrated) and John Squires from the "Freddy In Space" Facebook page/blog who did a great article on the film, PSYCHO II. One of the things that was so much fun about this book was finding some horror films that I had never heard of before, and reading about those I might have heard of but had never seen. There were only a handful of films I had never heard of, but there were quite a few I have to admit I have never seen. In fact, I went through and counted which ones I had seen and I had only seen 32 of the 101 films reviewed in this book!! And I consider myself a horror fan!! Shame on me, I obviously have some work to do! This is one of the best movie reference books out there right now in my opinion. 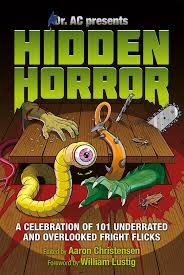 Any and all horror fans need a copy of HIDDEN HORROR on their bookshelf for sure. This is very nicely put together book. The book is 313 pages and includes tons of pictures from the films being reviewed. The price tag is awesome too, costing just $15! That is bargain for such a great book that is full of great movie info! 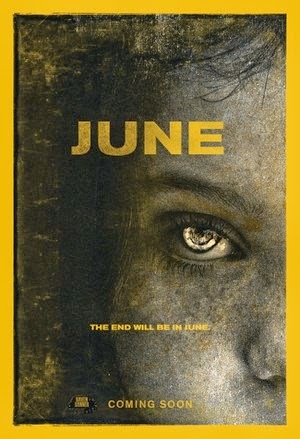 JUNE is currently in production. I think by the looks of this trailer we are in for a real treat with this film! Check out the trailer and let me know what you think! I think this looks like it could be a very cool film. It looks like it has elements of horror, sci-fi, fantasy, action, and martial arts, mixed into a creature feature! This looks like lots of fun! 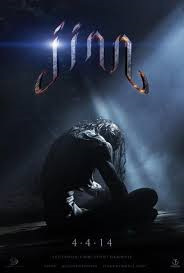 JINN will be in theaters 4/14 of this year! Check out the trailer and let me know what you think. This film is true psychological horror at it's best. What a crazy, messed up movie this is! The film was made in 1997, but was shot to look more like an old grindhouse film from the 1970's. 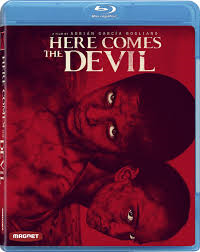 But you don't have to get too far into the film to realize this is not a simple grindhouse film, but a very smart, sophisticated foray into many topics involving the human mind, including greed, power, individualism, etc. The acting in this film is great. The actors portraying the patients in the mental hospital do a remarkable job. I would easily believe it if I was told they used actual mental patients to film this movie. Obviously they didn't, but the actors gave that good of a performance. The main plot revolves around a mad doctor that is implanting the patients with some kind of microchip that basically lets them all be on the same brain wavelengths. It lets them feel what all the others are feeling, both emotionally and physically. This is a very crazy scenario and makes for some very creepy scenes involving the patients. 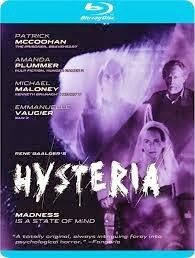 I would highly recommend HYSTERIA, but don't go into it thinking it is a pure horror film. There is no blood in the film, and only a few scenes of violence. Most of the film is a suspense/terror film that just messes with your mind, but I would definitely check this out if you get the chance. 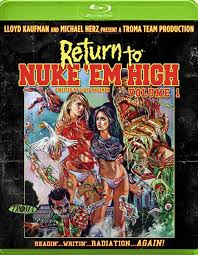 I honestly don't remember the last time I had this much fun watching a Troma film. 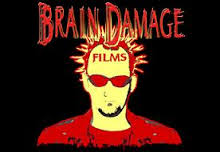 This movie had everything you would expect from a Troma film and more. One great thing about this movie was the humor. While some jokes did fall a little flat, most were laugh out loud hilarious. The movie was well written and paced perfectly. There were never any slow or dull moments throughout the film's run time. All the great Troma characters and stereotypes were present, but also present were some great young actresses who played the leads of Chrissy and Lauren. I expect to see much more from these two actresses in the future. Oh, and I couldn't do a review of a Troma horror film without mentioning the crazy, over-the-top gore. There is plenty of that on hand here, so gore hounds will not be disappointed! I love movies like this where people are trapped in a building and something crazy like this is going on outside around them. Before laptops and cell phones, no one would have known what was going on outside. This movie shows us know that with all the electronic gadgets we have nowadays, we are never truly alone and we can see and hear everything that is happening outside, whether we want to or not. This was a very enjoyable film for many reasons. The acting was so-so, nothing amazing here, but the way the film was made was worth the watch. The film had some great visuals, especially when the infected start to hallucinate. The film also had a good amount of gore. The writing was good with some very intense scenes, especially one in which a friend of the people barricaded inside the house comes to the door begging to be let in. The scene inside is just what I would imagine would really happen, with some of the people saying to let him in and others saying to keep him out. The struggle inside between the friends concerning a friend outside in need of help was very effective. The "Maniac Cop" is back from the dead and stalking the streets of New York once more. Officer Matt Cordell was once a hero, but after being framed by corrupt superiors and brutally assaulted in prison, he sets out on a macabre mission of vengeance, teaming up with a vicious serial killer to track down those that wronged him and make them pay... with their lives! 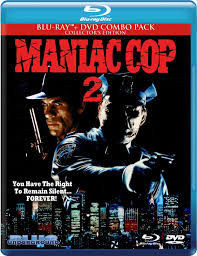 This was a very cool film with a simple plot, just the maniac cop going around killing people, but it was done so well that you have to give it credit when it comes to the cinematography and general camera work. That is the one thing that really stuck out for me was the camera work, something that normally goes unnoticed and under appreciated in most films. There were a couple of car chase scenes that were done remarkably well, leading me to ask myself how there were able to get some of those camera shots. I also liked that the maniac cop had some more creative kills in this film, my favorite being when he handcuffs a woman to the steering wheel of a car through the window (she was standing outside the car), then puts the car in neutral and pushes it down the downhill street! This was another instance of some great camera work and some great stunt work as you could tell this was actually a performed stunt, not a computer trick or green screened. 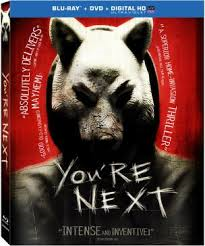 Enter to win a Blu-ray/DVD combo pack of YOU'RE NEXT on the Shattered Ravings website! My buddy Scott over at the Shattered Ravings Blog is giving one lucky winner a FREE Blu-ray/DVD combo pack of the great horror film, YOU'RE NEXT! If you don't already own this great film, this is an excellent chance to get your hands on a copy! Hurry and enter quickly, as this giveaway ends tomorrow, 3/12. CLICK HERE for details on how to enter for your chance to win! 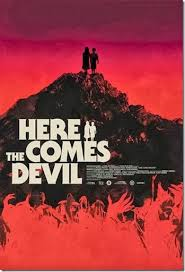 HERE COMES THE DEVIL combines modern indie filmmaking and storytelling with a hint of ‘70s-styled psychological horror that may not just be psychological. Francisco Barreiro and Laura Caro play parents Felix and Sol whose preteen son and daughter inexplicably re-appear after being lost overnight on a desolate, cave-riddled mountainside after a casual hike became every parent’s nightmare. 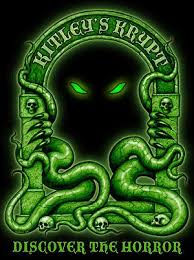 The good luck and good fortune of their return soon changes, as the children’s behavior suggests ominous and unspeakable events the night the children were lost that continue even now. As a loving couple - and loving parents - try to care for and protect their children, the ancient and half-whispered legends around the caves and the mountain and those who have gone there before become too strange to believe...and too dangerous, no matter how insane, to ignore. I highly recommend this movie. This film kept me entertained the entire run of the film. The acting was good, especially by the actors playing the grieving parents. One thing I loved about this film was how original it was. There is a huge twist in the film involving the kids, and it is one I never saw coming. I obviously can't reveal the twist here, but it is one that will really make you think. While blood and gore wasn't the main focus of the film, there were a couple of instances of some very good gore. This film is more about the story and it is a good story for sure. Very creepy and entertaining. My one complaint with this film was the cinematography. It looks like a different camera was used for some scenes, resulting in two different video qualities throughout the film. Also there was an over excessive use of the "fast zoom" in this film. I don't know if there is a technical term for it or not, but it's like what they used in old spaghetti westerns and kung-fu movies. You will know what I am talking about when you see it, and you will see it way too often in this movie. It doesn't take away from the film as a whole, but it was a little distracting. Overall this is was a great film, I thought. 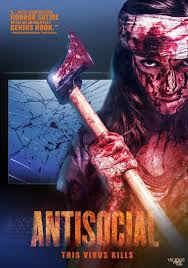 This is one I would recommend to any horror fan, especially those that are fans of foreign horror films. This was a very well made film with some great acting from lead Nicola Fiore, who plays the part of Farrah. She is a beautiful actress, but can play the part of a sadistic killer perfectly. It's hard to describe what sub-genre off a horror movie this fits into. It is part crime film, part slasher flick, part revenge film...all rolled into one. Gore hounds will love the large amount of blood in this film. There are some great gore scenes including a stabbing scene that is brutally realistic. A couple's son and daughter inexplicably reappear after being lost overnight on a desolate, cave-riddled mountainside. Becoming withdrawn and beginning to exhibit strange behavior, their parents quickly assume something sinister happened to them while missing and alone. But after hearing an ominous local legend... the concerned mother and father begin to realize that their children may have fallen prey to something inhuman - and that this dark, unstoppable evil has now returned home with them. Check out the trailer and let me know what you think! I will have a full review of the film in the upcoming week!